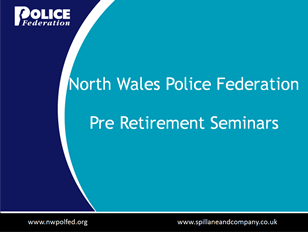 North Wales Police Federation, in partnership with Spillane and Co, have scheduled further two day Pre-Retirement Seminars for 2019, these courses are available to Officers and staff due to retire within the next 2 years. The Seminars will be held at DHQ St Asaph. Seminars will be held over a two day period commencing at 9.30 a.m. and it is anticipated that places on the Seminars will be very much sought after. Whilst partners are welcome, places will in the first instance be allocated to Police Officers/staff as a priority. The Seminars will include a range of inspirational and informative guest speakers who will cover a broad number of topics leading you up to and beyond your retirement. The programme for the Seminars covers pensions, state benefits, financial planning, investments, careers advice, health and wellbeing. Replies to be received by no later than Friday, 23rd November, 2018. If you have expressed an interest in attending a Seminar, you will be notified as soon as possible after the closing date of your allocated Seminar. If you have any queries please do not hesitate to contact Federation Admin Team on Ext. 05400.